Linda, you always put such an interesting spin on information we thought we already knew. You did deeper and make the reader think about preconceived notions. Keep up the great posts…most appreciated! My previous was business mainly focused on sales & sales management training. I always thought women made better sales people. They were better listeners, asked more questions, etc. The biggest challenge they faced, was usually one of confidence. Men often have similar confidence issues, but overcome it with testosterone like you said. It’s imepartive that more people make this exact point. 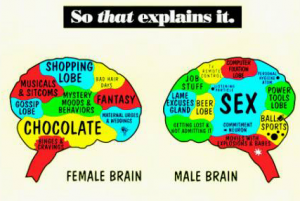 Nice to see that chocolate gets the largest portion of the woman’s brain. I completely concur with that.